Day 4, my friends. Hope you are enjoying the daily updates as it’s about to kill me. I’m trying to work in these articles in the middle of working on stuff at the office. It’s fun but I don’t think I could go daily for any longer a length of time. Yikes. Anywho, today’s topic discusses the plethora of super-powers that Superman has been imbued with over the years. It is shocking how much power Superman has been given since his first appearance in Action Comics #1. I want to thank SuperDickery.com for the comic panels I’m about to use. They have a great site with lots of funny stuff about Superman. Check them out. Everyone knows the many standard powers of Superman. He can fly, super-strength, super-speed, super-breath, invulnerable, heat-vision, etc, etc. Not everyone knows that he didn’t always have many of these abilities. Not only that, Superman has several other super powers that are less used, but still kept in his back pocket for just the right moment when he can whip it out and dazzle everyone. Today I’ll discuss the lesser known powers given to Superman by writers that needed a way out of a stupid story. Regardless of the reason, writers kept tacking on new powers for Superman each year. Supes was becoming so powerful that writers were having to come up with crazier situations to make it interesting, then they needed a new power to get out of that situation. It’s a never-ending cycle. Let’s take a look at some of the lesser known, and therefore more humorous, of Superman’s abilities. One of the more popular (by writers) powers Supes possesed was super-ventriloquism. Not only Super-V, he had a whole bag full of voice powers that writers tended to wield at their hip like gunslingers. Superman could throw his voice over great distances and also possesed super-voice-mimicry, which means he could make his voice sound like anyone else. That power must come in handy at parties when you are stuck talking to the dud who won’t leave you alone. You know the guy, he keeps talking about World of Warcraft and how his level 45 demon owns that level 40 gryphon from Akron, OH. If you were Supes, you could throw your voice across the room as someone else calling your name and you can get the hell out of there. Nicely done, Superman. Next up on the “wha-huh? !” list of super powers is Super-Mathematics. What is Super-Mathematics? Check this out for a demonstration. That looks like regular mathematics to me, Superman. I guess Super-Mathematics is really just regular mathematics, but faster and more super. And isn’t 20 x 16 x 10 = 3,200? And if you thought it was Superman’s muscles or good-looks that made Lois fall in love with him…OH NO. Apparently, Superman also possessed Super-Kisses. Yes, you read that correctly, Super-Kisses. I heard someone in the back call shenanigans on that one, but you can see for yourself. For all of you quilters and knitters out there, you were undoubtably drawn to reading Superman comics when you found out he had Super-Weaving powers. Now, to answer the question “Isn’t that just Superman weaving at super-speed?” before it’s even asked, I say no, only because it was much cooler and more impressive to say that he had a super-weaving power. Or is that just me? Speaking of dumb, welcome to the wonderful world of Super-Landscaping. Once again, you have to wonder if super-landscaping isn’t just a fancy name for “planting stuff at super speed”. But that’s just me. Maybe I should try that, running around my yard as fast as I can throwing plants at the ground. Think it would work? Okay, this is ridiculous. At this point, the writers are WAY out of control. Superman now has Super-Hunches?! I think they are just taking verbs and sticking the word Super in front of it. “I was Super-Walking across the street and a cop gave me a ticket for Super-Jaywalking. I had to Super-Call my lawyer to Super-Bail me out of jail. How Super-Embarrassing is that?” It’s Super-Stupid. Ditto for Super-Friction. Welding together bars with Super-Friction? 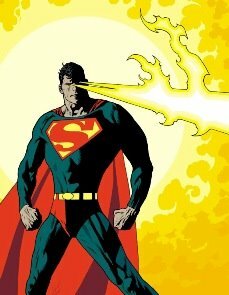 With all of his other powers did Superman somehow get Super-Alzheimer’s and not remember that he has HEAT VISION which would also work? Today’s final power I am going to discuss pretty much assumes you have no one but participants in the Special Olympics reading your comic. Writers labeled it Super-Makeup, but I call it “putting on a disguise”. The hell? If this is a super power then I could be a super hero. I get super-dressed in the morning then I get clean in a super-shower. Where’s my comic book? Well, I hope you enjoyed this rundown of some of Superman’s crazier abilities that you may not have been aware of. Tonight Steph and I are going to see Superman Returns so I, myself, will return tomorrow for the final day of Superman Week and my review of Superman Returns. This entry was posted on June 29, 2006 at 9:23 pm and is filed under comic books, humor, pop culture, Superman, Superman Returns with tags comic books, movie, pop culture, Superman, Superman Week. You can follow any responses to this entry through the RSS 2.0 feed. You can leave a response, or trackback from your own site.